In this week’s study from Tehillim / Psalms 118:1-29, the psalm opens saying, א הוֹדוּ לַיהֹוָה כִּי-טוֹב כִּי לְעוֹלָם חַסְדּוֹ: ב יֹאמַר-נָא יִשְֹרָאֵל כִּי לְעוֹלָם חַסְדּוֹ: 118:1 Give thanks to the Lord, for He is good; For His lovingkindness is everlasting. 118:2 Oh let Israel say, ‘His lovingkindness is everlasting.’ (NASB) The Aramaic Targum states, א שבחו קדם יהוה ארום טב ארום לעלם טוביה׃ ב יימרון כדון ישראל ארום לעלם טוביה׃ 118:1 Sing praise in the presence of the Lord, for he is good, for his goodness is forever. 118:2 Let Israel now say, “For his goodness is forever.” (EMC) The psalmist calls out to the people to give thanks and parallels this to the grace (chesed) of God being eternal. The rabbis translate the Chesed (grace) of God as referring to his goodness being eternal. The goodness of God is one of God’s attributes, it is a description of who He is at the core. The Lord is inherently good as it says in Tehillim / Psalm 34:8 “Taste and see that the LORD is good; blessed is the one who takes refuge in him.” The Lord God of Israel is the foundation of goodness and of everything that is good. Note that people can have good traits or do good deeds, but goodness is not in our character; our goodness comes from the Lord. The goodness of God is made manifest in His creation, as we read in Bereshit / Genesis 1:31 “God saw all that he had made, and it was very good…” The goodness of God is available to us regardless of our situation in life as Yeshua stated in Matthew 5:45 “…He causes his sun to rise on the evil and the good, and sends rain on the righteous and the unrighteous.” We also read in Tehillim / Psalm 145:9 “The LORD is good to all; he has compassion on all he has made.” The goodness of God provides us with a perfect model for our lives. By getting to know the Lord God of Israel, we learn of His goodness and we learn to recognize what it means to truly be good to others, even our enemies. The Lord’s goodness to us causes us to strive for and to do good things towards others. King David said in Tehillim / Psalms 119:68, “You are good, and what you do is good; teach me your decrees” (NASB). The Lord God in heaven and His Messiah Yeshua leads us and teaches us about goodness and how to do good things. This goodness of God gives us assurance of His purpose for our lives as being good. Just as a parent wants good for their children, our Heavenly Father wants only good things for us as well. James 1:17 states, “Every good and perfect gift is from above, coming down from the Father of the heavenly lights, who does not change like shifting shadows.” We know also the Lord disciplines those who are His children. As a result, good things may not always show up as happy experiences. Sometimes good can come disguised as adversity or hardship, which the Lord may use for good, as we learn in Romans 8:28: “And we know that in all things God works for the good of those who love him, who have been called according to his purpose.” The goodness of God also offers for us security and encouragement were we depend upon the unchanging goodness of God in our lives. Tehillim / Psalm 52:1 states, “The goodness of God endures continually” (NASB). These Scriptures reveal to us that the Lord God is always good and that His character does not change. The goodness of the God of Israel draws us to the Lord where His goodness towards us, those whom are his and those who are not are meant to draw us to Him. This was demonstrated at the highest level in sending His Son Yeshua the Messiah to lead us in the way of salvation. It is because of His goodness that we are given opportunities to hear His word and to believe for eternal life by believing in Yeshua as our Lord and Savior. The goodness of God is at the core of our faith because it is because of His goodness that He calls each of us to salvation. The goodness of God leads to His blessing upon us in sustaining us in His provisions for life, food, crops, drink (water), the homes that we live in, and the ability to help others by our blessing and the abilities the Lord gives to us. The outcome of all of these things is to lead us to show the goodness of God to others every day. In addition to this, the goodness of God also demands justice and truth. Contained in the goodness of God is this idea of genuine justice, when the punishment of the wicked (an evil man) is extended beyond the time of the actual involvement of the commission of the crime. The goodness of God allows for the extension or delay of punishment for the purpose of repentance. True justice combined with genuine goodness allows for the one who committed the crime to repent. Those who do not repent and turn from their sins will at death enter into a spiritual state of being banished from the presence of God. Being exposed to the presence of God and of His holiness, righteousness, goodness, and love, to then be separated would be unbearable. It is a separation from everything that is pure and good, everything that is right and wholesome, and everything that makes for joy and tranquility; we really are not prepared to appreciate the gravity of such a circumstance. This is the point of the goodness of God giving us the opportunity to repent, to turn from our sins and to turn to the righteous ways of God. The priesthood declares the same saying, ג יֹאמְרוּ נָא בֵית-אַהֲרֹן כִּי לְעוֹלָם חַסְדּוֹ: ד יֹאמְרוּ נָא יִרְאֵי יְהֹוָה כִּי לְעוֹלָם חַסְדּוֹ: 118:3 Oh let the house of Aaron say, ‘His lovingkindness is everlasting.’ 118:4 Oh let those who fear the Lord say, ‘His lovingkindness is everlasting.’ (NASB) The Aramaic Targum states, ג יימרון כדון בית אהרן ארום לעלם טוביה׃ ד יימרון כדון דחליא דיהוה ארום לעלם טוביה׃ 118:3 Let the house of Aaron now say, “For his goodness is forever.” 118:4 Let those who fear the Lord now say, “For his goodness is forever.” (EMC) The text states the lovingkindness (Chesed) of God is eternal. The rabbis call this the goodness of God. A common expression among some Christians is that we are living in the age of grace. If you ask them what they mean by their statement, they will often make a reference that we are living in an age when God still grants grace to those seeking salvation through His Son. Likewise, there are some that tie this phrase to a time period described as the church age developed by theologies such as dispensationalism. This begs the question of whether the grace of God is time specific? It is interesting according to the Psalm, the grace (Chesed) of God is eternal (לְעוֹלָם חַסְדּו). The eternality of the grace of God begs the question of this idea of dispensationalism. We see this great attribute of God revealed in Shemot / Exodus 34:6-7, of His great graciousness. The Psalm of David reminds us of this great fact, the grace and mercy of God, His long suffering, abounding in Chesed and Emet (truth). dispensationalism is a false theology and leads many from the truth that God’s mercy was from since the beginning of creation. David appeals to God’s revealed character by crying out to him as he said in Tehillim / Psalms 118:5-13, ה מִן-הַמֵּצַר קָרָאתִי יָּהּ עָנָנִי בַמֶּרְחָב יָהּ: ו יְהֹוָה לִי לֹא אִירָא מַה-יַּעֲשֶֹה לִי אָדָם: ז יְהֹוָה לִי בְּעֹזְרָי וַאֲנִי אֶרְאֶה בְשֹנְאָי: ח טוֹב לַחֲסוֹת בַּיהֹוָה מִבְּטֹחַ בָּאָדָם: ט טוֹב לַחֲסוֹת בַּיהֹוָה מִבְּטֹחַ בִּנְדִיבִים: י כָּל-גּוֹיִם סְבָבוּנִי בְּשֵׁם יְהֹוָה כִּי אֲמִילַם: יא סַבּוּנִי גַם-סְבָבוּנִי בְּשֵׁם יְהֹוָה כִּי אֲמִילַם: יב סַבּוּנִי כִדְבוֹרִים דֹּעֲכוּ כְּאֵשׁ קוֹצִים בְּשֵׁם יְהֹוָה כִּי אֲמִילַם: יג דָּחֹה דְחִיתַנִי לִנְפֹּל וַיהֹוָה עֲזָרָנִי: 118:5 From my distress I called upon the Lord; The Lord answered me and set me in a large place. 118:6 The Lord is for me; I will not fear; What can man do to me? 118:7 The Lord is for me among those who help me; Therefore I will look with satisfaction on those who hate me. 118:8 It is better to take refuge in the Lord Than to trust in man. 118:9 It is better to take refuge in the Lord Than to trust in princes. 118:10 All nations surrounded me; In the name of the Lord I will surely cut them off. 118:11 They surrounded me, yes, they surrounded me; In the name of the Lord I will surely cut them off. 118:12 They surrounded me like bees; They were extinguished as a fire of thorns; In the name of the Lord I will surely cut them off. 118:13 You pushed me violently so that I was falling, But the Lord helped me. (NASB) David states that he cried out to the Lord and the Lord answered him and set him in a large place. This suggests a place of security from those who hate him. The psalmist describes his enemies as numerous as bees, and it does not matter the numbers, the Lord is able to deliver even from the most violet and viscous of enemies. The Aramaic Targum states, ה מן עקתא קריתי יה אלהא קביל צלותי בפתאוא יה אלהא׃ ו מימרא דיהוה בסעדי לא אדחל מה יעבד לי בר נש׃ ז מימרא דיהוה למסעדא יתי ואנא איחמי פורענותא בסנאי׃ ח טב למתרחצא במימרא דיהוה מן למירחץ בבר נש׃ ט טב למתרחצא במימרא דיהוה מן למירחץ ברברביא׃ י כל עממיא חזרו אקפון יתי בשום מימרא דיהוה רחיצית ארום אתושינון׃ יא אקפון לי אף חזרו יתי בשום מימרא דיהוה רחיצית ארום אתושינון אתושישינון׃ יב אקפון לי היך זיבורייתא דבורייתא דלקון היך אשתא בכובין בשום מימרא דיהוה רחיצית ארום אתושינון אתושישינון׃ יג מדחי מדחא דחיית יתי חובי למינפל ומימרא דיהוה סייעני׃ 118:5 Out of distress I called to Yah, Yah accepted my prayer in a broad place. 118:6 The word of the Lord is my help, I will not fear, what will a son of man do to me? 118:7 The word of the Lord is helping me, and I will behold vengeance on my foes. 118:8 It is better to trust in the word of the Lord than to rely on a son of man. 118:9 It is better to trust in the word of the Lord than to rely on rulers. 118:10 All the Gentiles have surrounded me; in the name of the word of the Lord I have put my trust, for I will tear them apart. 118:11 They have encompassed me, indeed, surrounded me; in the name of the word of the Lord I have put my trust, for I will tear them apart. 118:12 They have encompassed me like hornets; they burned like fire in thorns; in the name of the word of the Lord I have put my trust, for I will tear them apart. 118:13 But you have knocked me down to make me fall; and the word of the Lord has given me help. (EMC) The rabbis describe the word of the Lord as helping deliver the psalmist from vengeance, from relying upon man, from being surrounded by the enemy, from the fire, and from being torn apart. The word of the Lord is powerful. According to Hebrews 4:12, “the word of God is alive and active. Sharper than any double-edged sword, it penetrates even to dividing soul and spirit, joints and marrow; it judges the thoughts and attitudes of the heart.” The “word of God” here is the written word or the spoken Word from the Torah. The Scriptures describe the Word as “alive” and active. This idea of the Word being alive suggests an inherent power that is found within the Word of God. The Word of God accomplishes the purposes of God (Isaiah 55:11). The Word of God goes forth and affects the heart of man and that Word has the desired effect such that the will of God is accomplished. This Word that goes forth produces lasting effects with the heart of a person. This is then manifested in the way one lives his or her life. This Word of God is capable of producing a crop (Matthew 13:1-23) that is a hundred fold. The psalmist states that the Word of God is to be trusted in. The Word of God gave David help. We see the Word of God in action in the pages of the Bible. When Peter spoke the Word of God, the Scriptures say that the people “were cut to the heart and said to Peter and the other apostles, ‘Brothers, what shall we do?’” (Acts 2:37). The power in the Word resulted in “many of those who had heard the word believed” (Acts 4:4). The Word of God is alive because it has been given from the living God (Hebrews 3:12). Yeshua speaks of this aspect of the Word being alive when he said, “The words I have spoken to you, they are full of the Spirit and life” (John 6:63). Other aspects of this living Word are that it sustains man (Luke 4:4), it brings faith (Romans 10:17), it accomplishes God’s will (2 Timothy 2:9), it can be slandered (Titus 2:5), it gives spiritual birth (1 Peter 1:23), and it abides within God’s people (1 John 2:14). We see the power of the Word of God whenever someone repents and turns to the ways of God and His Messiah for eternal life. The person of faith bears the testimony of God as actively working in the life of His people. The word of God is active in the lives of God’s people. The Psalmist states the Word of God is a delight. When we think upon these things, does the Word of God work powerfully in your life? Is God’s Word a delight as the Psalmist states? The Scriptures today are often downplayed in favor of man made theologies which detract from the power and authority of the Word of God. The Word of God is still powerful and very much alive. The Apostle Peter said in 1 Peter 1:19 “We also have the prophetic message as something completely reliable, and you will do well to pay attention to it, as to a light shining in a dark place, until the day dawns and the morning star rises in your hearts” Note how the light shining in a dark place is the Word of God raising in our hearts. The psalmist states, טו קוֹל | רִנָּה וִישׁוּעָה בְּאָהֳלֵי צַדִּיקִים יְמִין יְהֹוָה עֹשָֹה חָיִל: טז יְמִין יְהֹוָה רוֹמֵמָה יְמִין יְהֹוָה עֹשָֹה חָיִל: יז לֹא אָמוּת כִּי-אֶחְיֶה וַאֲסַפֵּר מַעֲשֵֹי יָהּ: 118:14 The Lord is my strength and song, And He has become my salvation. 118:15 The sound of joyful shouting and salvation is in the tents of the righteous; The right hand of the Lord does valiantly. 118:16 The right hand of the Lord is exalted; The right hand of the Lord does valiantly. 118:17 I will not die, but live, And tell of the works of the Lord. 118:18 The Lord has disciplined me severely, But He has not given me over to death. 118:19 Open to me the gates of righteousness; I shall enter through them, I shall give thanks to the Lord. (NASB) It is interesting how the psalmist repeats the right hand of the Lord does valiantly in 118:16 and 118:17. This is connected to the joyful shout of His people and the salvation that is found in the tents of the righteous. This suggests the Lord’s involvement in the lives of the righteous. In addition, the Lord disciplines the ones he loves (118:18) but notice how the Lord does not give us over to death, His will is not to kill us. Note how the gods of the nations are not viewed in this way as being merciful, loving, and long suffering. Our God disciplines and not for death. The Aramaic Targum states the following, יד תוקפי ותושבחתי דחיל על כל עלמא עממיא יהוה אמר במימריה והוה לי לפריק׃ טו קל תושבחתא ופורקרנא במשכנהון דצדיקי ימינא דיהוה עבדת חילא׃ טז ימינא דיהוה מרממא ימינא דיהוה עבדת חילא׃ יז לא אימות ארום איחי ואישתעי עובדי אלהא׃ יח מכסנא אכסנני יה ולמותא לא מסר יתי׃ יט פתחו לי מעלני קרתא דצידקא אעול בהון אשבח יה אלהא׃ 118:14 My strength and my praise are fearful against all the world; the Lord gave command by his word, and has become my redeemer. 118:15 The sound of praise and redemption is in the tents of the righteous; the right hand of the Lord has done mightily. 118:16 The right hand of the Lord is exalted; the right hand of the Lord has done mightily. 118:17 I will not die, for I will live, and I will tell of the deeds of God. 118:18 Truly has Yah punished me, but he did not hand me over to death. 118:19 Open to me the entrances of the city of righteousness; I will enter them, I will praise Yah. (EMC) David speaks of the gates of the righteous and entering through them (118:19-20) where the Targum translates this as being the gates of the city. The city of the righteous, Jerusalem. This is connected to giving thanks because the Lord answers His people’s prayers (118:21 I shall give thanks to You, for You have answered me, And You have become my salvation. NASB). It is within this context we read David writing the following, כב אֶבֶן מָאֲסוּ הַבּוֹנִים הָיְתָה לְרֹאשׁ פִּנָּה: כג מֵאֵת יְהֹוָה הָיְתָה זֹּאת הִיא נִפְלָאת בְּעֵינֵינוּ: כד זֶה-הַיּוֹם עָשָֹה יְהֹוָה נָגִילָה וְנִשְֹמְחָה בוֹ: 118:22 The stone which the builders rejected Has become the chief corner stone. 118:23 This is the Lord’s doing; It is marvelous in our eyes. 118:24 This is the day which the Lord has made; Let us rejoice and be glad in it. (NASB) The Aramaic Targum states, כב טליא שביקו ארדיכליא הות ביני בניא דישי וזכה לאתמנאה למליך ושולטן׃ כג מן קדם יהוה הות דא אמרו ארדיכליא היא פרישא קדמנא אמרו בנוי דישי׃ כד דין יומא עבד יהוה אמרו ארדיכליא נדוץ ונחדי ביה אמרו בנוי דישי׃ 118:22 The child the builders abandoned was among the sons of Jesse; and he was worthy to be appointed king and ruler. 118:23 “This has come from the presence of the Lord,” said the builders; “it is wonderful before us,” said the sons of Jesse. 118:24 “This day the Lord has made,” said the builders; “let us rejoice and be glad in it,” said the sons of Jesse. (EMC) The Aramaic translation is interesting since the rabbis translate this as the stone the builders rejected is in reference to the son of Jesse. Yeshua the Messiah uses Tehillim / Psalms 118:22-23 in reference to himself as the Messiah and of the foundation stone. The context of this psalm is found in Matthew 21:22-46. Yeshua speaks of a parable of a vineyard that was given to men to take care of and to honor the landowner who seeks for the proceeds of the vineyard each year. The men who worked the vineyard thought their responsibility to the landowner was not important. They abused the men who were sent to the vineyard to receive a portion of their fruits of the vineyard. The Lord places us in His kingdom to produce good works and He expects to receive those things for His glory. These men who were put in charge of the kingdom were doing so for their own glory. Yeshua says the landowner (our Father in heaven) will bring these wicked servants to a wicked end. It is within this context that Yeshua speaks of Tehillim / Psalms 119:22-23 saying, 21:42 Jesus said to them, ‘Did you never read in the Scriptures, ‘The stone which the builders rejected, This became the chief corner stone; This came about from the Lord, And it is marvelous in our eyes’? (NASB) He says that the kingdom of God wil lbe taken away from these people and given to others. The point is 21:43 ‘Therefore I say to you, the kingdom of God will be taken away from you and given to a people, producing the fruit of it. 21:44 ‘And he who falls on this stone will be broken to pieces; but on whomever it falls, it will scatter him like dust.’(NASB) Those who find themselves having faith in the God of Israel and His Messiah, they will produce the fruit of it. Yeshua says the stone, this foundation stone that falls upon a man will break him to pieces. This illustrates the idea that we will be broken and our lives will change for the glory of God to do good works (Ephesians 2:10). This is consistent with the commentary Kedushat Levi on Leviticus Tazria 5. The rabbis say the proper course of a man is to perform deeds that reflect the glory of God. This is synonymous to bearing the testimony of God. The commentary speaks of sublimating the body such that it serves the Lord. Doing good deeds pleases the Lord. These things cause us to understand the magnitude of who we are as the crown of His creation. This is said to be paralleled to the explanation on Tehillim / Psalms 118:23. The commentary states, “as we described the ‎אור חוזר‎, “the reflective light,” ‎good deeds performed by man in response to G’d having blessed ‎him with light…” where light is paralleled to righteousness in the Scriptures. This is paralleled to the fruits of the spirit, and the fruit that is produced of whom the landowner seeks from us. Our Father in heaven seeks these things, He seeks for us to bear His testimonies for His glory. The Psalm concludes saying, כה אָנָּא יְהֹוָה הוֹשִׁיעָה נָּא אָנָּא יְהֹוָה הַצְלִיחָה נָּא: כו בָּרוּךְ הַבָּא בְּשֵׁם יְהֹוָה בֵּרַכְנוּכֶם מִבֵּית יְהֹוָה: כז אֵל | יְהֹוָה וַיָּאֶר לָנוּ אִסְרוּ-חַג בַּעֲבֹתִים עַד קַרְנוֹת הַמִּזְבֵּחַ: כח אֵלִי אַתָּה וְאוֹדֶךָּ אֱלֹהַי אֲרוֹמְמֶךָּ: כט הוֹדוּ לַיהֹוָה כִּי-טוֹב כִּי לְעוֹלָם חַסְדּוֹ: 118:25 O Lord, do save, we beseech You; O Lord, we beseech You, do send prosperity! 118:26 Blessed is the one who comes in the name of the Lord; We have blessed you from the house of the Lord. 118:27 The Lord is God, and He has given us light; Bind the festival sacrifice with cords to the horns of the altar. 118:28 You are my God, and I give thanks to You; You are my God, I extol You. 118:29 Give thanks to the Lord, for He is good; For His lovingkindness is everlasting. (NASB) The Aramaic Targum states, כה בבעו מינך יהוה פרוק כדון אמרו ארדיכליא בבעו מינך יהוה אצלח כדון אמרו ישי ואנתתיה׃ כו בריך דאתי בשום מימרא דיהוה אמרו ארדיכלי יברכון יתכון מן בית מקדשא דיהוה אמר דוד׃ כז אלהא יהוה אנהר לנא אמרו שבטיא דבית יהודה כפיתו טליא לניכסת חגא בשושלוון עד די תקרבוניה ותדון אדמיה בקרנת מדבחא אמר שמואל נבייא׃ כח אלהי את ואודי קדמך קומך אלהי אשבחינך אמר דוד׃ כט מתיב שמואל ואמר שבחו כנישתא דישראל אודו קדם יהוה ארום טב ארום לעלם טוביה׃ 118:25 “If it please you, O Lord, redeem us now,” said the builders; “if it please you, O Lord, prosper us now,” said Jesse and his wife. 118:26 “Blessed is he who comes in the name of the word of the Lord,” said the builders; “they will bless you from the sanctuary of the Lord,” said David. 118:27 “God, the Lord, has given us light,” said the tribes of the house of Judah; “bind the child for a festal sacrifice with chains until you sacrifice him, and sprinkle his blood on the horns of the altar,” said Samuel the prophet. 118:28 “You are my God, and I will give thanks in your presence; my God, I will praise you,” said David. 118:29. Samuel answered and said, “Sing praise, assembly of Israel, give thanks in the presence of the Lord, for he is good, for his goodness is everlasting.” (EMC) All of these things bring a powerful context for Yeshua the Messiah and for us as His people. The perspective of God for His people is for us to live obedient to the command. This appears to be the definition of the righteous way of God. The Torah defines the righteousness of God’s children. Based upon the Torah and the Apostolic Writings, Yeshua’s words Himself emphasize the commands as an important part of walking in the spirit. The commands are more than a suggestion but are vitally important in the life of a believer. We are called to be generous, loving, and showing mercy to all. This is the Way of God. Yeshua taught us to walk in God’s Ways. Let’s Pray! 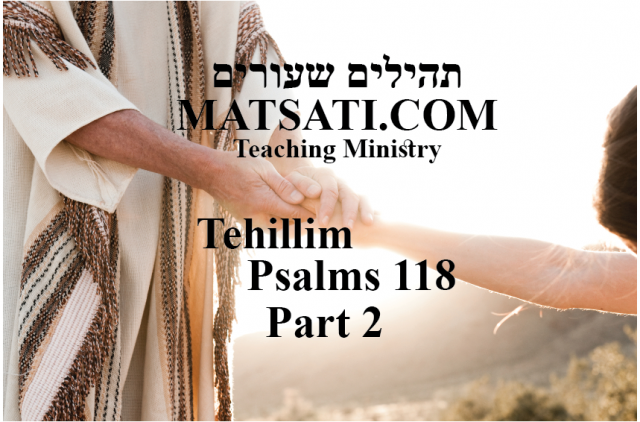 The Rabbinic Commentary (Midrash) on Tehillim / Psalms 118 has 22 parts. Reading through the Midrash we will be looking at Part 2, 3, 10, 11, and 13. Let’s begin by outlining Midrash Tehillim Chapter 118, Parts 2, 3, 10, 11, and 13. The משל (mashal) “the parable,” goes on to explain the פתיחתא (Petihta), the rabbis speak of the blessings and the curses. The נמשל (Nimshal) “expansion on the parable” expands upon the משל (mashal), with a discussion on the mercy of the Lord towards the righteous. The נמשל (Nimshal) “expansion on the parable” expands upon the משל (mashal), with discussion on the only way to repay the Lord for what He has done is by making an avowal to be His people. The משל (mashal) “the parable,” goes on to explain the פתיחתא (Petihta), the rabbis speak of not fearing the judgment of God. The נמשל (Nimshal) “expansion on the parable” expands upon the משל (mashal), with discussion on the Lord being in the midst of the people, the Lord being one of our own countryman. The משל (mashal) “the parable,” goes on to explain the פתיחתא (Petihta), the rabbis speak of trusting in the Lord and provide five examples of the lives of men who trusted in the Lord. The נמשל (Nimshal) “expansion on the parable” expands upon the משל (mashal), with discussion on Abraham who did not following in the ways of his father and mother but trusted in the promises of God. The משל (mashal) “the parable,” goes on to explain the פתיחתא (Petihta), the rabbis speak of the nations surrounding Israel. The נמשל (Nimshal) “expansion on the parable” expands upon the משל (mashal), the rabbis speak of no fearing the nations because the Lord will destroy them very easily. ב דבר אחר אמרו צדיק כי טוב [כי פרי מעלליהם יאכלו]. אתה מוצא הברכה עושה פירות, אבל הקללה אינה עושה פירות, שנאמר אוי לרשע רע כי גמול ידיו יעשה לו (ישעיה ג יא), כפרי אינו אומר, אלא כי גמול ידיו, שאין הקללה עושה פירות. דבר אחר אמרו צדיק כי טוב. אמרו לצדיקו של עולם כי טוב, במה שהוא עושה לכם, את מוצא בראש השנה הכל עומדין בדין לפני הקב״ה, וכל אומה ואומה אומרים אנו זכינו בדין, ויום הכיפורים בא והקב״ה מזכה את ישראל וסולח לעוונותיהם, שנאמר כי ביום הזה יכפר עליכם (ויקרא יו ל), ועדיין אין אנו יודעים מי זכה בדין, וכיון שחג הסוכות בא , ישראל נוטלין לולוביהן, ומקלסין לצדיקו של עולם, ויודעין שישראל זוכין בדין, מה הם אומרים, הודו לה׳ כי טוב כי לעולם חסדו, הוי אומר אמרו צדיק כי טוב. 2. In another comment, the verse is read Say unto the righteous, that it will be well with him; for they will eat the fruit of their doings (Isaiah 3:10), You find that the blessing bears fruit, and that the curse does not bear fruit, as is said Woe unto the wicked. It will be ill with him; for the work of his hands will be done to him (Isaiah 3:11). Note that the verse does not say, fruit of his hands, but work of his hands, because the curse does not bear fruit. In another comment, the verse is read, Say unto the Righteous that He is good, that is, say unto the Righteous One of the universe that He is good in whatever He does for you. You find that on New Years Day everyone is summoned to judgment before the Holy One blessed be He, and every people of the earth claims, In the judgment we have been found righteous. Even when the Day of Atonement comes, and the Holy One blessed be He, acquits the people of Israel and forgives them their iniquities, as is said For on this day will atonement be made for you to cleanse you that you may be clean from all your sins (Vayikra / Leviticus 16:30), we still cannot know who were found righteous in the judgment. When the Feast of Tabernacles comes, however, the people of Israel take their palm branches and praise the Righteous One of the universe, and it is then that we know that only the people of Israel were found righteous in the judgment. And what do they say? O give thanks unto the Lord, for He is good, for His mercy endures forever. Hence, Say unto the Righteous that He is good. The rabbis speak of the blessings and the curses. It is interesting how they make their comments upon these things saying, “You find that the blessing bears fruit, and that the curse does not bear fruit, as is said Woe unto the wicked. It will be ill with him; for the work of his hands will be done to him (Isaiah 3:11). Note that the verse does not say, fruit of his hands, but work of his hands, because the curse does not bear fruit.” The way they speak of the blessing bearing fruit and the curse not bearing fruit, this is very important because it speaks to what is written in the Apostolic Writings in regards our bearing good fruit or not bearing fruit at all. Note what is written in the Apostolic Writings in regard to bearing good fruit. Yeshua says that false prophets come to consume God’s people and the sign of healthy people is demonstrated by the kind of fruit they produce. Notice how Yeshua says that He has chosen us to go and bear fruit meaning that we are to produce works of righteousness. Those whom the Lord chooses are appointed to produce good fruit. Those who are not the Lords do not produce good fruit. The Apostle Paul defines what good fruit is by listing those things that are the fruit of the spirit (love, joy, peace, patience, kindness, goodness, faithfulness, gentleness, self-control). The rabbis parallel this to the blessings and the curses that are listed in the Torah and what Moshe summarizes in Devarim / Deuteronomy 11:24-28. The midrash speaks of New Years day as this pertains to Yom Kippur and standing before the Lord on judgment day. The rabbis speak of the righteous being acquitted of their sins and forgiven. Those who are righteous seek the righteousness of God in their lives. The point is that we do not seek righteousness and forgiveness one day a year. We are called to seek His righteousness all the days of our lives. This is found in seeking to follow in the footsteps on Yeshua God’s Messiah. This seeking God’s righteousness is not a self righteousness but a humble way of walking in God’s ways of justice and truth. The Greek word used for “fruit” is “karpos” and it refers to the fruit of vines or trees. In the Tanach it can refer to one’s children which are born of a family. The fruits of the flesh are evident in most of the world, among those who are not saved. The fruits of the flesh include “sexual immorality, impurity, sensuality, idolatry, sorcery, enmity, strife, jealousy, fits of anger, rivalries, dissensions, divisions, envy, drunkenness, orgies, and things like these” (Galatians 5:19-21). Yeshua said “I am the vine; you are the branches. Whoever abides in me and I in him, he it is that bears much fruit, for apart from me you can do nothing” (John 15:5). The key here is that apart from abiding in the vine, we cannot produce anything at all which is why He said “Abide in me, and I in you. As the branch cannot bear fruit by itself, unless it abides in the vine, neither can you, unless you abide in me” (John 15:4). You will never see a branch producing any fruit unless it’s attached to the vine or tree, the source of nourishment. This is why it is so important to believe in Yeshua as our Messiah. When we do this our Father in heaven places in our hearts the desire to live for Him and our lives change, we truly and deeply desire to live for Him. We seek the way of life and not the ways of death. This is who we are as God’s people, humbling ourselves, studying God’s Word, and living our lives as Yeshua lived in His serving the Lord our Father in heaven. The rabbis say that we can now know who will be found righteous in the judgment. When it comes to someone else, we cannot know, however, when it comes to each of us individually, we can know if we are living our lives the way our Father wants us to and keeping our faith in His Messiah Yeshua, we can be assured of our place in the world to come. Midrash Tehillim 118, Part 2 concludes saying, “When the Feast of Tabernacles comes, however, the people of Israel take their palm branches and praise the Righteous One of the universe, and it is then that we know that only the people of Israel were found righteous in the judgment. And what do they say? O give thanks unto the Lord, for He is good, for His mercy endures forever. Hence, Say unto the Righteous that He is good.” The feast of Tabernacles parallels the Lord dwelling in our midst as He did for Israel so many years ago. The conclusion of the midrash saying those who praise the Lord with palm branches during the feast of Tabernacles as the only righteous ones is related to these people who choose to following the Lord God of Israel and His ways including His appointed times (Moedim). This is synonymous to “listening to the commandments of the Lord your God” and the one how humbles his life to be obedient to the Word of the Lord. Remember, this is why the author of Hebrews in Hebrews 4:12-14 states the word of God is powerful to divide the soul and spirit flesh and bone, because the word discerns the heart and whether one will humble himself to obey God, and demonstrates the kind of love one has for the Lord. These are those who seek first the kingdom of God (Matthew 6:33). We are to seek the things of God as a priority over the things of the world. Yeshua spoke of seeking the salvation that is inherent in the kingdom of God because it is of greater value than all the world’s riches. We are called to take care to do the work of the Lord, seeking His salvation, living in obedience to Him, and sharing the good news of the kingdom with others. We ask ourselves: “Where do I primarily spend my energies? Is all my time and money spent on goods and activities that will perish, or in the services of God, the results of which live on for eternity?” Yeshua taught these principles and these are also the principles that are being taught to us in the Torah and the midrash. ג דבר אחר הודו לה׳ כי טוב. זהו שאמר הכתוב ואמרת ביום ההוא אודך ה׳ (ישעיה יב א), אין לישראל מה שישלמו להקב״ה אלא הודייה בלבד על כל טובה שעושה עמהם, שנאמר ה׳ אלהי אתה ארוממך אודה שמך כי עשית פלא (שם ישעיהו כה א), כיון שראה דוד ההודייה טובה, אמר הודו לה׳ כי טוב, וכן הוא אומר מכסה פשעיו לא יצליח [ומודה ועוזב ירוחם] (משלי כח יג), ואומר אודה עלי פשעי לה׳ (תהלים לב ה), בשביל שהודיתי ואתה נשאת עון חטאתי סלה (שם שם תהלים ל״ב), וכן הוא אומר טוב להודות לה׳ (שם תהלים צב ב), לכך הודו לה׳ כי טוב, כל מי שהוא מודה לפניו הוא לוקח טוב, שנאמר קחו עמכם דברים וגו׳ [וקח טוב] (הושע יד ג). 3. In another comment, the verse is read, Avow the Lord, for He is good. Elsewhere, Scripture says, And in the day you will say, I will avow You, O Lord (Isaiah 12:1). The children of Israel have no other way of repaying the Holy One blessed be He, for all the wonderful things He does for them, except by avowing Him, as is said, O Lord, You are my God, I will exalt things (Isaiah 25:1). When David saw what a good thing is the avowal of God, he said, O avow the Lord, for He is good. Thus, Scripture says also, He that covers his transgressions will not prosper; but whoso avows and forsakes them will obtain mercy (Tehillim / Psalms 28:13). And again, I make avowal of it, You forgive always the iniquity of my sin. Scripture says again It is a good thing to avow the Lord (Tehillim / Psalms 92:2). Hence, O avow the Lord, for He is good. He who avows Him, takes good unto himself, as is said, Take with you words, and return unto the Lord, and so make good (Hosea 14:3). It is interesting to read the midrash state “The children of Israel have no other way of repaying the Holy One blessed be He, for all the wonderful things He does for them, except by avowing Him, as is said, O Lord, You are my God, I will exalt things (Isaiah 25:1).” This is a significant statement because it parallels the Christian interpretation “Salvation is a gift given by grace and cannot be earned by our obedience.” The basis for this is according to the apostle Paul to the Ephesians, “For by grace you have been saved through faith, and that not of yourselves; it is the gift of God, not of works, lest anyone should boast” (Ephesians 2:8-9). The author of Hebrews warns that it is possible to “neglect so great a salvation” (Hebrews 2:3) if we do not pay attention to what we have heard as the author states, “For this reason we must pay much closer attention to what we have heard, so that we do not drift away from it.” (Hebrews 2:1). The author of the book of Hebrews warns us of spiritual drift. This leads us to the idea that we need to be zealous to follow God’s way of life. This includes what Yeshua taught the rich young ruler saying, “If you want to enter into life, keep the commandments” (Matthew 19:17). The point is the only way to be happy is to be like God, which the Lord designed through His laws. The reason being, we are to humble ourselves and our lives to be obedient to His Word. When we do so, living in righteousness, holiness, justice, and truth, to obey God’s Word is for our good and for the good of those around us. We must recognize that God’s Torah is as important for us as it was required for Yeshua to die on our behalf. This leads us to choose to strive to avoid sin in our lives. This is consistent with what is written in the midrash which states, “Thus, Scripture says also, He that covers his transgressions will not prosper; but whoso avows and forsakes them will obtain mercy (Tehillim / Psalms 28:13). And again, I make avowal of it, You forgive always the iniquity of my sin. Scripture says again It is a good thing to avow the Lord (Tehillim / Psalms 92:2).” The Lord covers our transgressions, forgives our sins, and all we can do is give Him thanks and continue in the faith living our lives for His glory. Obedience to God’s “perfect law of liberty” (James 1:25) should be our natural response to Yeshua’s sacrifice and gift of forgiveness of our sins. Note “this should be our natural response to Yeshua and our Father in heaven.” Midrash Tehillim 118, Part 3 concludes saying, “Hence, O avow the Lord, for He is good. He who avows Him, takes good unto himself, as is said, Take with you words, and return unto the Lord, and so make good (Hosea 14:3).” Hosea’s words lead us to Teshuvah, to turn our lives from sin and to turn towards the way of the Lord. י ה׳ לי בעוזרי. משל למה הדבר דומה לבני אדם שהן באין לדון אצל בימה, והן מתייראין מן הדין, אמרו אל תיראו מן הדין אלא תעיזו לבבכם, כך ישראל עתידין לעמוד בדין לפני הקב״ה והן מתייראין מן הדין, ומלאכי השרת אמרו להם אל תתיראו מן הדין, אין אתם מכירין אותו, בן עירכם הוא, שנאמר הוא יבנה עירי וגלותי ישלח (ישעיה מה יג), ושבו ואמרו להם אל תתיראו מן הדין, אין אתם מכירים אותו קרובכם הוא, שנאמר לבני ישראל עם קרובו (תהלים קמח יד) [ושבו ואמרו להם אין אתם מכירים אותו] אחיכם הוא, שנאמר למען אחי ורעי (שם תהלים קכב ח), ויותר מכן אביכם הוא, הלא הוא אביך קנך (דברים לב ו). 10. The Lord is for me as my Helper (Tehillim / Psalms 118:7). By what parable is this verse explained? By the parable of two men who came to the judge’s bench, fearing his judgment. They were told, Fear not the judgment. Strengthen your hearts. Just so, the people of Israel will be summoned to judgment before the Holy One blessed be He, fearing His judgment. But the ministering angels will say, Fear not the judgment. Do you not know Him? He is your townsman, as is said, He will build My city, and he will let My exiles go free (Isaiah 45:13). And they will also say, Fear not the judgment. Do you not know Him? He is your kinsman, as is said, The children of Israel, a people that are His kin (Tehillim / Psalms 148:14). And they will say further, Do you not know Him? He is your brother, for He said, For My brethren and companions’ sake (Tehillim / Psalms 122:8). He is even more; He is your Father, Is not He your Father that has gotten you? (Devarim / Deuteronomy 32:6). The rabbis speak of fearing the judge. To “Fear of the Lord” generally refers specifically to a sense of respect, awe, and submission to the Lord. Fear in the general sense as fearing God suggests an apprehension of Divine punishment. The Jewish philosopher and Torah scholar Maimonides spoke of the fear of the Lord as the feeling of human insignificance that is coupled to the contemplation of God’s great and wonderful actions for His people. The first mention of the fear of God in the Hebrew Bible is in Bereshit / Genesis 22:12, where Abraham is commended for putting his trust in the Lord. Having the fear of God is most often considered to be a positive sign of spiritual growth and to the possibility of being lifted up and used in the same way the great men of faith were used of God in the Scriptures. We are humbly aware of the Lord possibly using us for His greatness to lead many to freedom and faith in HaShem and His Messiah Yeshua. The midrash proceeds with a parable of two men who came to the judge’s bench fearing the judgment. They were told, do not fear the judgment with the parallel to Israel being summoned before the Lord and the angels saying not to fear the Lord. They say, “He is your townsman, as is said, He will build My city, and he will let My exiles go free (Isaiah 45:13). And they will also say, Fear not the judgment. Do you not know Him? He is your kinsman, as is said, The children of Israel, a people that are His kin (Tehillim / Psalms 148:14).” The idea is the Lord dwells in the midst of His people in such a way that he becomes a friend, someone not to be feared but to be respected and loved. Shemot / Exodus 2:25 states, 2:25 So God looked on the Israelites and was concerned about them. (NIV) This reminds us of the basis for the creation and preservation of God’s people, and of the responsibilities which accompany the privilege of being a part of His people. We do have responsibilities as the children of God. The Lord God of Israel set apart a special people as the object of His blessings, and as the instrument through which these blessings would be poured out on the nations (Bereshit / Genesis 12:1-3). It is in this way we are to demonstrate God’s character to others. We are to be holy, as He is holy, and gracious as He is gracious. We are to care for the widows, orphans and strangers, as a manifestation of His care for the defenseless. The Lord God’s power is demonstrated through His care and protection of His people. These things are understood as a God who lives in our midst, who is known as a friend, and as one who is not to be feared. We do not fear the Lord because of His mercy and love towards us. Thank you Lord for your great mercy and love towards us. Midrash Tehillim 118, Part 10 concludes saying, “And they will say further, Do you not know Him? He is your brother, for He said, For My brethren and companions’ sake (Tehillim / Psalms 122:8). He is even more; He is your Fahter, Is not He your Father that has gotten you? (Devarim / Deuteronomy 32:6).” The midrash concludes with the idea that the Lord is our friend and even may be called our brother. This brings the context of being able to talk to the Lord as a friend and discuss our problems as with a brother. This demonstrates the kind of relationship we have with our God. The rabbis open their commentary from the Psalm on trusting in the Lord rather than man. There are eight reasons why it is better to trust in the Lord than in man. The Lord God of Israel does not lie, but men are given to lying. The Lord God of Israel does not fail, but men fail for a variety of reasons. The Lord God of Israel is faithful; men on the other hand are not faithful. The Lord is the finisher of our faith, the author of Hebrews (12:2) states that Yeshua the Messiah is the author and finisher of our faith. The Lord God of Israel is omniscient and man is finite and limited in his understanding. The Lord does not forget His promises. Man on the other hand does forget his promises. The Lord God of Israel will never betray our confidence. In this world we all get beat up in one manner or another in the walk of life. As a result, sometimes it becomes very difficult to trust in others by the way we have been hurt. Watching the daily news is just one tragic story after another. Random and senseless crime, shootings in homes, courthouses, grocery stores, and even in our high schools, demonstrate the increase in tragedy our need to rely upon one who is trustworthy, true, and provides a solid foundation. The Lord God of Israel and His Messiah Yeshua provides for us this sense of having someone to rely upon because the Lord does not forget his promises. The Apostle Paul speaks about these traits in 2 Timothy 3:1, and concludes that all of these things will occur in the last days. יא [טוב לחסות בה׳ מבטוח באדם]. חמשה דברים עמדו בעולם, נח שם עבר אשור ואברהם, נח לא הקפיד לעבוד הקב״ה אלא עמד ונטע כרם, שם ועבר הטמינו את עצמם, אשור אמר היאך אני דר בין הרשעים הללו והלך לו, שנאמר מן הארץ ההוא יצא אשור (בראשית י יא), אברהם צדקתו עומדת לעולם, אמר איני מניח את הקב״ה, ואף הקב״ה לא הניחו, שנאמר אני ה׳ אשר הוצאתיך מאור כשדים (שם בראשית טו ז), טוב לחסות בה׳ מבטוח באדם , שלא היה בוטח לא על דברי אביו, ולא על דברי רבו, לומר אבי היה צדיק ואני נמלט בצדקתו, ותרח הי׳ רואה במזלות, ראה מזלו של הרן שהוא נשרף, ומזלו של אברהם שכל העולם מתמלא ממנו, נכנסו כל האומות אצל אברהם אבינו אמרו לו של מי אתה, אמר להם של הקב״ה שבשמים, מיד נטלוהו והשליכוהו לתוך כבשן האש, ולא ירד עמו לא עיר ולא שרף ולא מלאך, אלא הקב״ה בעצמו, שנאמר אני ה׳ (אלהיך) אשר הוצאתיך מאור כשדים (בראשית טו ז), הרן היה לבו חלוק והיה בוטח על דברי אביו, נכנסו כל האומות אצלו, אמרו לו של מי אתה, אמר בלבבו אברהם גדול ממני, אם ראיתיו שנמלט, אומר אני של אברהם אני, ואם לאו אומר אני שלכם אני, כיון שנמלט אברהם אמר להם של אברהם אני, מיד נטלוהו והשליכוהו לתוך כבשן האש, לא הספיק לירד עד שהמיתו האש, והשליכו המלאך לפני אביו, שנאמר וימת הרן על פני תרח אביו (בראשית יא כח), ותרח יפה היה רואה במזלות מזלו של הרן שהוא נשרף, ומזלו של אברהם שהעולם נתמלא ממנו ואינו יודע אם מן האנשים, או מן הנשים, ושרי היתה בתו של הרן, שנאמר ויקח אברם ונחור להם נשים שם אשת אברם שרי וגו׳ בת הרן אבי מלכה ואבי יסכה (שם בראשית יא כט) ויסכה היא שרה, ונתמלא כל העולם ממנה. 11. It is better to take refuge in the Lord than to trust in man (Tehillim / Psalms 118:8). Five leading personages, Noach, Shem, Ever, Asshur, and Abraham arose in the world. Noach was not overly concerned about worship of the Holy One blessed be He, but set himself to the business of planting a vineyard. Shem and Ever withdrew from the world. Asshur said, How will I live among these wicked men? And he exiled himself, as is said, out of that land went forth Asshur (Bereshit / Genesis 10:11). As for Abraham, whose righteousness endures forever (Tehillim / Psalms 112:9), he said, I will not leave the Holy One blessed be He. And indeed, the Holy One blessed be He, did not leave him, as is said, I am the Lord that brought you out of the fire of the Chaldees (Bereshit / Genesis 15:7). It is better to take refuge in the Lord than to trust in man. Abraham had no trust either in the words of his father or in the words of his mother. For Terah, who was a star-gazer, saw in the star of Haran that the whole world was to be peopled out of Haran, and saw in the star of Abraham that Abraham was to be cast into the fire. Men of all the nations came into the house of our father Abraham and asked him, With whom do you belong? And he answered, With the Holy One blessed be He, that is in heaven. At once they seized him and cast him into the fiery furnace. And therein went down with him neither watch angel, or seraph, or any angel, but the Holy One Himself blessed be He, as is said I am the Lord that brought you out of the fire of the Chaldees (Bereshit / Genesis 15:7). As for Haran, his heart was divided, but he had trust in the words of his father. And so when men of all the nations came into his house and asked him, With whom do you belong? He said in his heart, Abraham is greater than I. If I see him saved, I will say, I belong with Abraham; and if he is not saved, I will say, I belong with you. After Abraham was saved, he said to them, I belong with Abraham. At once they seized him and cast him into the fiery furnace, and even as he went down, the fire slew him, and an angel flung him into the presence of his father, as is said, And Haran was dead in the presence of his father Terah (Bereshit / Genesis 11:28). Thus Terah saw rightly in the stars, the star of Haran foretold that the world was to be peopled out of Haran, and the star of Abraham foretold that Abraham was to be cast into the fire; but Terah did not know from the stars whether the world was to be peopled out of the male line or out of the female line. Now Sarai was the daughter of Haran as is said, And Abram and Nahor took them wives, The name of Abram’s wife was Sarai; and the name of Nahor’s wife, Milcah, the daughter of Haran, the father of Milcah, and the father of Iscah (Bereshit / Genesis 11:29) Iscah being another name for Sarah out of whom the whole world was peopled. The midrash speaks of these five men leaving their previous abode of trusting in the Lord. Noah was not concerned with worshiping the Holy One blessed be He. The idea of worship is found in the context of what one does, how one lives his life. This is illustrated from the rabbis comments and the example of the vineyard. The rabbis say both Shem, Ever, and Asshur withdrew from the world. The reason they withdrew was because of the wickedness of those who lived around him. The midrash states that only Abraham whose deeds endured forever, because he had wholly trusted in the Lord God of Israel. The reason being is the rabbis say that Abraham had no trust in the words of his father or mother. The midrash adds the context, “For Terah, who was a star-gazer, saw in the star of Haran that the whole world was to be peopled out of Haran, and saw in the star of Abraham that Abraham was to be cast into the fire.” This would give reason for Abraham to leave Tera and Haran, but we know the reason Abraham left was because He had trusted in the Lord God of Israel and His promises. The men of Haran would have cast Abraham into the furnace because of his faith. This is the kind of attitude that we encounter whenever we speak of our faith to those who are in the world. The midrash states, “And therein went down with him neither watch angel, or seraph, or any angel, but the Holy One Himself blessed be He, as is said I am the Lord that brought you out of the fire of the Chaldees (Bereshit / Genesis 15:7).” The idea is the Lord did not send someone else to deliver Abraham, he went Himself and brought him out of the fire. This is consistent with the Torah context of the Lord going before His people and with His people dwelling in their midst. The midrash continues with the story of Tera and Haran, where Haran is killed in the fire, and Tera used astrology to see the future which he could not do, and did not know whether the world was to be populated from the male or female line. Midrash Tehillim 118, Part 11 concludes saying,, “Now Sarai was the daughter of Haran as is said, And Abram and Nahor took them wives, The name of Abram’s wife was Sarai; and the name of Nahor’s wife, Milcah, the daughter of Haran, the father of Milcah, and the father of Iscah (Bereshit / Genesis 11:29) Iscah being another name for Sarah out of whom the whole world was peopled.” This idea of populating the entire world from Abram or Sarai is an interesting concept. This speaks all of the world being the children of Abraham and would be considered the righteous seed of Abraham. The rabbis see the Lord God of Israel desiring for all of the world to follow in the ways of Abraham, a godly man of faith, one who trusted wholly in the Lord. This leads us to the idea of the Lord desiring for the world to obey His Torah. This is what the prophet Isaiah saw in his vision of the last days. This idea of all to world going before the Lord, to the land of Israel, to the temple mount to study God’s word and apply it to life, where there will be no more war, this is what the Lord desires and is the way in which we should seek to live before the Lord, to daily apply His word to our lives. יג דבר אחר כל גוים סבבוני. שהוא עתיד לכנוס כל האומות ולהעלותם לירושלים, וישראל מתייראין באותה שעה, והקב״ה אומר להם אל תיראו, שנאמר אל תיראי תולעת יעקב (ישעיה מא יד), וכל הפרשה והלא פרוכים, לכך נאמר בשם ה׳ כי אמילם. סבוני גם סבבוני. שהוא עתיד לתפוש שבטו של יהודה ולאסור אותו, וכסבורים למסור כל אחד ואחד לשונאים שלו, ויאמרו יבואו אחינו וישלטו בנו, ואל ישלטו בנו שונאינו, שנאמר ואמרו אלופי יהודה בלבם (זכריה יב ה), והקב״ה עושה להם נסים ומפיל שונאיהן לפניהם, שנאמר ביום ההוא אשים את אלופי יהודה וגו׳ (שם שם זכריה י״ב ו), והלא פרוכים, לכך נאמר כי אמילם. סבוני כדבורים. מה הדבורה הזו מכנסת דבש לבעליה, כך עתיד הקב״ה ליכנס כל אומות העולם ולהעלותם לירושלים, שנאמר הנה יום בא לה׳ וחולק שללך בקרבך (שם זכריה יד א) יכול שיש בהם ממש, ת״ל דועכו כאש קוצים, משל למלך שנכנסו עליו גנבים, והיה המלך פקח, אמר המלך אם אני עומד עליהם מיד הם אומרים מה מצאת בידינו במחתרת, אלא יודע אני שהן עתידין לבא שלשה פעמים, ואני עומד עליהם והורגן, כך המלך זה הקב״ה, הגנבים אלו האומות, שנאמר ואספתי [את] כל הגוים אל ירושלים למלחמה (שם זכריה יד ב), המחתרת זה העיר ירושלים, שנאמר ונלכדה העיר ונשסו הבתים (שם שם זכריה י״ד), זה הביזה, והנשים תשכבנה (שם שם זכריה י״ד) אלו העריות, ויצא חצי העיר בגולה (שם שם זכריה י״ד), זו השביה, והקב״ה יוצא ונלחם עמהם, שנאמר ויצא ה׳ ונלחם בגוים ההם (שם שם זכריה י״ד ג), והקב״ה משלח בהם מגפה, שנאמר וזאת תהיה המגפה אשר יגוף ה׳ את כל העמים (שם שם זכריה י״ד יב), וכל הפרשה והלא פרוכים, לכך נאמר כי אמילם. 13. Another interpretation, All nations compassed me about (Tehillim / Psalms 118:10) that is Gog and Magog will assemble all the nations and bring them to ascend against Jerusalem, and in that hour the children of Israel will be afraid, but the Holy One blessed be He, will say to them, Fear not, as it is said, Fear not, you worm Jacob (Isaiah 41:14), for Gog and Magog will be crushed to dust. Hence it is said, But in the name of the Lord I will destroy them (Tehillim / Psalms 118:10). They compassed me about, yes, they compassed me about (Tehillim / Psalms 118:11) that is, Gog and Magog will lay hold of the tribe of Judah and bind it, intending to make every man in Judah serve his foes. But the men of Judah will say, Oh that our brothers would come and rule over us, so that our foes will not have dominion over us, as is said, And the chiefs of Judah will say in their heart (Zechariah 12:5). Strengthen for my sake the inhabitants of Jerusalem. And the Holy One blessed be He, will do miracles for them, for He will cause their foes to be devoured before them, as is said, In that day will I make the chiefs of Judah like a torch of fire among sheaves; and they will devour all the peoples round about (Zechariah 12:6), until their foes are consumed to ashes. Hence the Psalm says, I will destroy them. They compassed me about like bees (Tehillim / Psalms 118:12). Just as a bee gathers honey for her masters, so the Holy One blessed be He, will gather all the nations and bring them to ascend against Jerusalem, as is said, Behold, the day of the Lord comes, and your spil will be divided in the midst of you (Zechariah 14:1). Lest it be thought that the nations will have force enough for their attack to be felt, the Psalm says, They are quenched as the fire of thorns (Tehillim / Psalms 118:12). A parable of a king into whose house came some thieves. Now the king was wise. So the king said, If I set upon them at once, they will say, Do you find in our hands any of the property of the place we have broken into? But I know that they will come three times, and the third time I will set upon them and slay them. The king is the Holy One blessed be He. The thieves are the hostile nations, as is said, For I will gather all nations against Jerusalem to battle (Zechariah 14:2). The place that is broken into is the city of Jerusalem, as is said, And the city will be taken, and the houses rifled, broken into for spoil. And the woman will be made to lie down, the women will be ravished. And half of the city will go forth into exile into captivity. But the Holy One blessed be He, will go forth and fight against the hostile nations, as is said Then will the Lord go forth, and fight against those nations. And the Holy One blessed be He, will send a plague upon them, as is said, And this will be the plague wherewith the Lord will strike all the peoples that have warred against Jerusalem (Zechariah 14:2), until they are consumed to dust. Hence, the Psalm says, I will destroy them. The rabbis open their commentary using Gog and Magog as striking fear in the people of Israel. Surveying the Scriptures on Gog and Magog (גּוֹג וּמָגוֹג‎) in the Hebrew Bible, these two may be individuals, peoples, or lands; a prophesied enemy nation of God’s people according to the Book of Ezekiel (38:15; 39:3-9), and one of the nations according to Genesis (Bereshit / Genesis 10:2) descended from Japheth son of Noah. Note something here in the Midrash, the Gog prophecy is meant to be fulfilled at the approach of what is called the “end of days”, but not necessarily the end of the world. Jewish eschatology views Gog and Magog as enemies to be defeated by the Messiah, which will usher in the age of the Messiah. Christianity’s interpretation is more apocalyptic making Gog and Magog allies of Satan against God at the end of the age, as we read in the Book of Revelation. Gog and Magog are referenced in Ezekiel 38-39 and in Revelation 20:7-8. Note that these two instances carry the same names, the Scriptures reveal they do not necessarily refer to the same people and events. In Ezekiel’s prophecy, Gog will be the leader of a great army that attacks the land of Israel. Gog is described as “of the land of Magog, the prince of Rosh, Meshech, and Tubal” (Ezekiel 38:2-3). Based upon the Christian interpretation, Ezekiel’s battle of Gog and Magog occurs in the tribulation period, in the first 3 1/2 years. The interpretation follows from Ezekiel 38:3 and 38:11) when the attack occurs during a time of peace. Ezekiel provides the description of a nation that laid down its defenses. The idea is that Israel will be at peace and is why the interpretation is believed to be in the first 3 1/2 year period. The idea is that at this point the war will begin. Gog will be defeated by God Himself on the mountains of Israel. The slaughter will be so great it will take seven months to bury all of the dead (Ezekiel 39:11-12). Based upon this context, let’s look at what the Rabbis have to say in Midrash Tehillim 118, Part 13. The opening phrase states, “ Another interpretation, All nations compassed me about (Tehillim / Psalms 118:10) that is Gog and Magog will assemble all the nations and bring them to ascend against Jerusalem, and in that hour the children of Israel will be afraid, but the Holy One blessed be He, will say to them, Fear not, as it is said, Fear not, you worm Jacob (Isaiah 41:14), for Gog and Magog will be crushed to dust. Hence it is said, But in the name of the Lord I will destroy them (Tehillim / Psalms 118:10).” The midrashic interpretation has the Gog and Magog assembling all of the nations against Israel. This sounds as if this is a reference to an eschatological event (end of age). The rabbis believe these nations will enslave Judah to serve his enemies. The Lord God Almighty performed miracles in the past leading to the expectation of His future help. The midrash uses a parable to illustrate the situation. The way Yeshua describes the people, they want to kill him in the way the nations seek to kill God’s people according to the midrash. Yeshua says that these people do not understand, they are not children of God, or children of Abraham, and so they do not hear, understand, or believe in God’s word or Yeshua His Messiah. Note how Yeshua says if God is our Father, we would love Him. Do you love Yeshua? Do you believe He is the Son of God? Do you claim to know and have God’s word in your heart but “hate at most” or “loath at the least” who Yeshua is? Do you spend your life attempting to find reason for fault in Yeshua? Yeshua says that you do not hear His words because you do not have or do not believe in the truth and in our Father in heaven. There is an intimate connection between faith in Yeshua and knowing our Father in heaven. This is the reason we need to pray for the Lord to increase our faith every day. Let’s Pray!